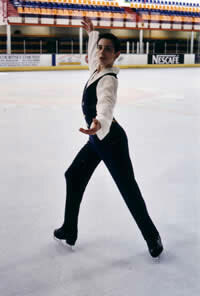 BISC's top male free skater, Simon Waller, has finally proved his potential as a future British championship medallist. Not only did he skate almost clean programmes in the junior championship qualifying class at Blackburn on August 26, but he beat two opponents he had never beaten before. "Jon Bonny and I have always believed that I would come good at the higher levels because I started later than most of my rivals," Simon said "It has seemed like I have always been catching up, and my broken ankle in 2001 did not help. Now I have not only caught up but I am beginning to overtake and will continue to do so as long as I don't have another serious injury." Simon got off to a very good start by landing a superb double axel and excellent flying sit spin in the short programme. Coupled with choreography which boosted his artistic marks, he came first in the short, ahead of Nottingham-based David Richardson and Elliot Hilton who had always beaten him previously and pushed him out of medal contention in the 2001 novice championship and 2002 primary championship. Simon also had a good skate in the long programme but was pipped to second place by virtue of Elliot landing a triple jump and double axel combination. "The result has really boosted me. If these two are beatable, then so are the rest, if not this year, then next," Simon said. Sarah Johnson, the club's top female free skater, took another step in her bid to compete in this year's British Junior Ladies' Championship by having one of her best ever skates this season in the qualifying Open competition at Nottingham on September 6. when she came second. She missed the combination but did the other jumps although the double axel and triple salchow weren't fully rotated..
She was pleased to come second out of four behind Jo Webber but ahead of Laura Matthews. One Bracknell skater came back with two trophies from her day out in Swindon, winning her first free skating class and an artistic. Fiona Piggott, skating for Basingstoke, came 4th of 5 in the Level 4, girls, 12 and over class, and 1st in the any age, any level, exhibition class. Rebecca Forsyth, 12, and Christo- pher Hockaday, 14, (pictured above) who won bronze in this year's British Novice Ice Dance Championship, won the Welsh Novice Ice Dance Championship in Cardiff on Septem- ber 15, beating a couple who had beaten them in the British. They were equal first in the compulsory section - winning the first dance and coming second in the second - and won the original dance section. The club's synchro section has reintroduced its Skater of the Month award. The first winner-in August-was Susie Race, 11, who has been in the squad for about six months and skates with the novice Ice Precise team.